Bread, ekmek, is a main staple in Turkish cuisine and the loaf of bread takes the center piece in Turkish homes, for breakfast, lunch and dinner. We also have a delicious and very popular dessert, made with the special (dehydrated) bread soaked in syrup, the delicious Ekmek Kadayifi. One of the treasures that my parents kindly brought over from Turkey when visiting us was this special dehydrated bread used for making Ekmek Kadayifi. Topped with the thick Turkish clotted cream, kaymak, it is a heavenly and a very satisfying dessert. Ekmek kadayifi is also served during religious festivals like the end of Ramadan celebrations, Seker Bayrami, in Turkey. 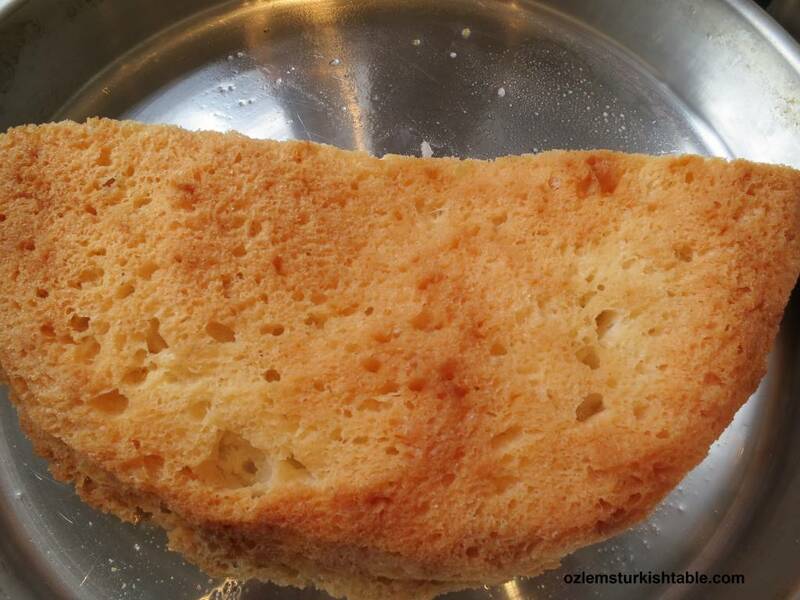 Ekmek kadayifi, the dry, dehydrated bread is first soaked in hot water. Ekmek kadayifi is very popular in Antakya, where my roots are from and you can easily get this special dehydrated bread from bakeries and pastry shops to make the dessert in Uzun Carsi, Antakya. 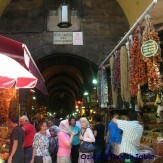 It is also available in Eminonu, Kadikoy – Istanbul and in most parts of Turkey. 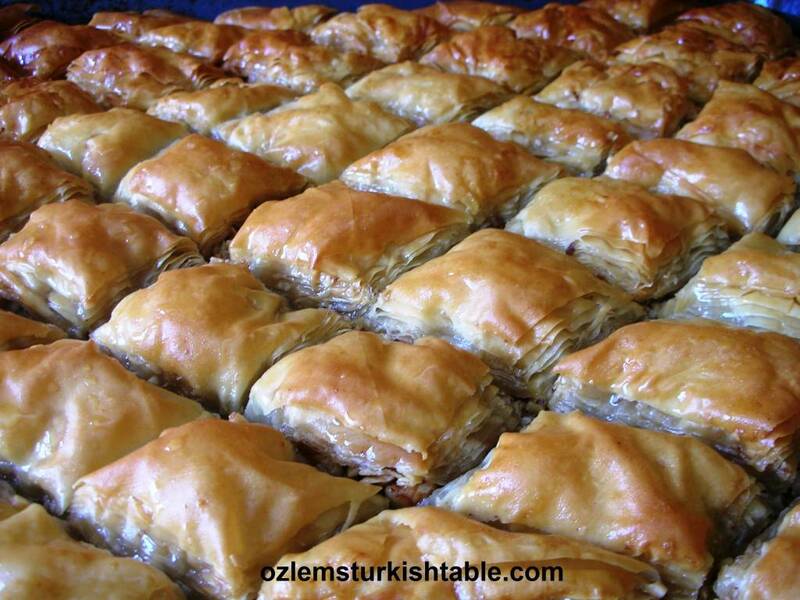 Ekmek Kadayifi is a popular dessert that you can enjoy in restaurants and pastanes (patisseries) all around Turkey. Unfortunately it is difficult get this dehydrated bread abroad. Middle Eastern shops, Turkish shops and online Turkish stores like Tulumba.com and Best Turkish Food.com may carry them, worth checking. I have also seen crumpets being used as an alternative to this dehydrated bread abroad. If using crumpets, you’ll need to adjust the syrup quantity. Pour the syrup over ekmek kadayifi evenly and let it soak the syrup. 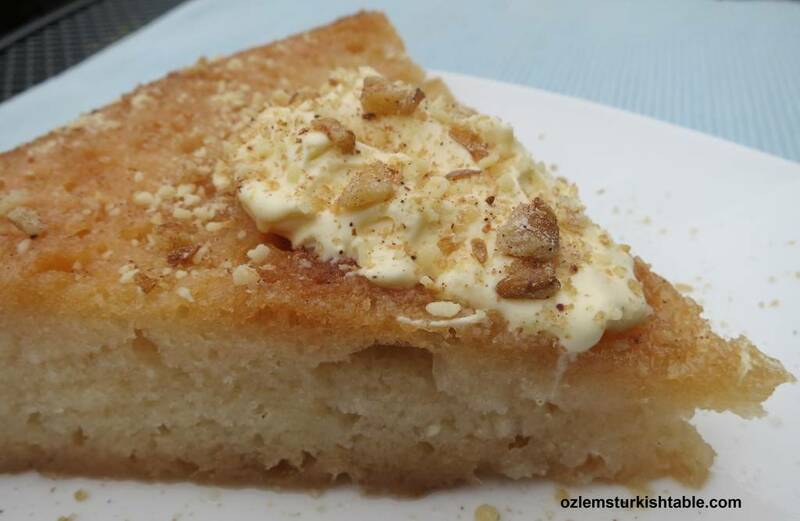 Ekmek kadayifi is a very easy and a bountiful dessert. First you will need to soak the dry bread in hot water and it will dramatically expand, almost doubling the size, so bear this in mind. The next stage is the addition of the syrup and letting the bread soak the syrup. I have used half of dry ekmek kadayifi (15 cm/6” in diameter) and it served 8 people generously. Kaymak, Turkish thick clotted cream is the traditional accompaniment, if you can’t get kaymak, clotted cream (as found in the UK) or a dollop of mascarpone cheese also work well. Delicious Ekmak Kadayifi; Turkish bread pudding in syrup; delicious with kaymak or clotted cream. I don’t enjoy very sweet desserts and my syrup here is less sweet and fragrant with the lemon juice. We served ekmek kadayifi with crushed walnuts and glad to see everyone really enjoyed it – hope you enjoy yours too. Ekmek Kadayifi is a traditional and very popular Turkish dessert made with the special (dehydrated) bread soaked in syrup. 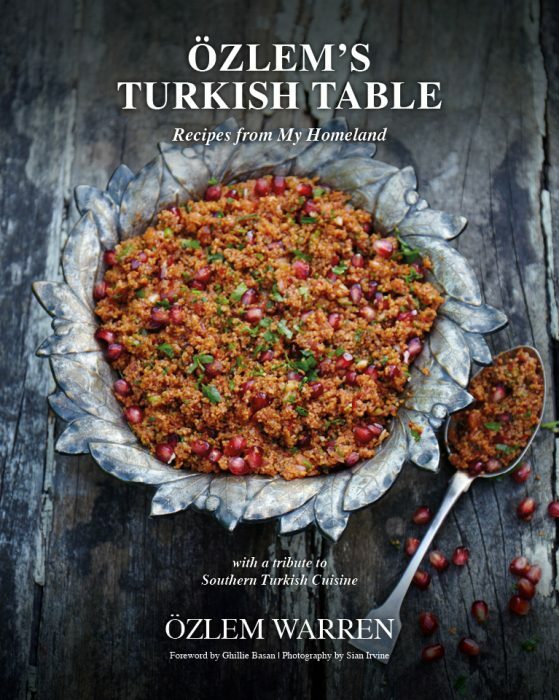 It is served with kaymak, the thick Turkish clotted cream and ground walnuts or pistachio nuts over it. Clotted cream or mascarpone cheese may be a good substitution, if you can't get kaymak. Place the dehydrated ekmek kadayifi, the dried special bread in a large tray. Pour the how water evenly over the dry bread, making sure it’s all wet. Let the bread absorb the water for 15 minutes. After 15 minutes, the bread will be almost doubled its size. Get a clean kitchen towel and gently press and pat on the soaked bread to get rid of all the excess water in the soaked bread and in the tray. At the end of this stage, there should be no excess water remained. Take care not to press too hard, so that the bread won’t break. In a saucepan, stir in the sugar and hot water. Dissolve the sugar and bring to a boil. Then squeeze the ¼ lemon juice and the leave the lemon in the sauce pan. Turn the heat to low and simmer the syrup over 20 minutes, stirring occasionally. Then turn the heat off. 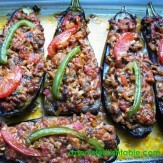 Pour the syrup over the ekmek kadayifi evenly and cook for 25 -30 minutes on medium heat. Turn the pan occasionally so that all parts get to cook evenly. Spoon the syrup in the tray over ekmek kadayifi ; all syrup will be soaked at the end. Remove from the heat and let the ekmek kadayifi rest for 15 minutes. 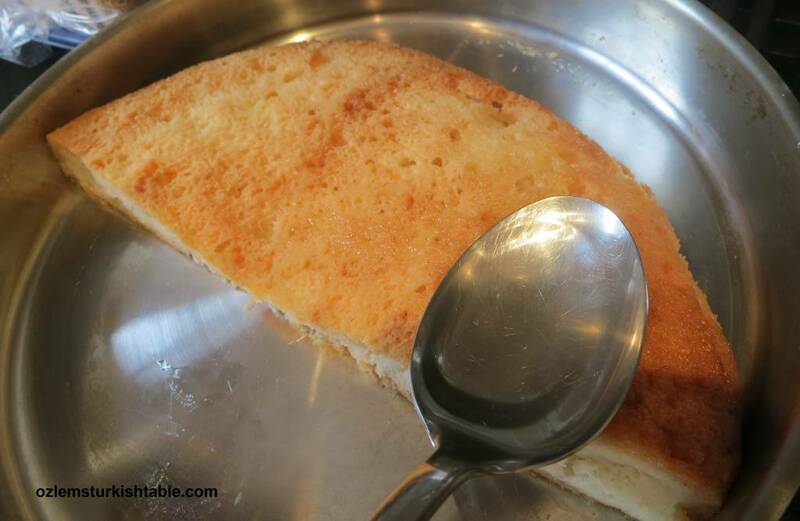 Slice and turn the ekmek kadayifi upside down to a serving dish. You can serve at room temperature or after chilled in the refrigerator. You can serve the ekmek kadayifi with Turkish thick clotted cream, kaymak and crushed walnuts over the slice. The British clotted cream or mascarpone cheese would also complement ekmek kadayifi well, if you can’t get kaymak. You will need a large circle or square tray to make this bread pudding, bear in mind that the bread will almost double its size once soaked in water. 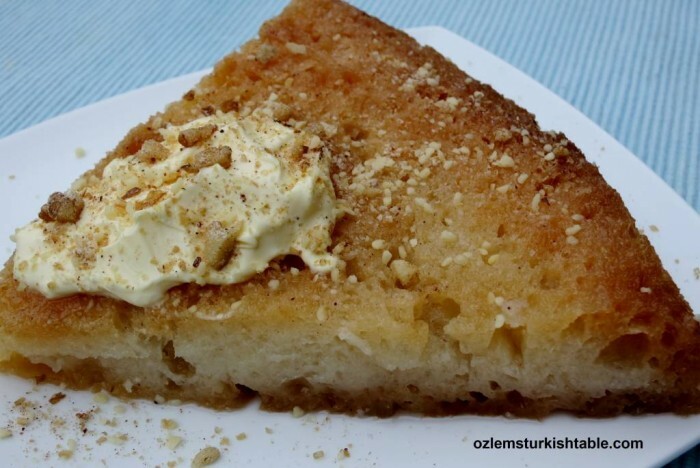 Delightful dessert, Ozlem, I could almost taste it as I read! And can’t think of a better use for a few days old bread. A must try soon:) xxPeri. I usually find this too sweet too, so will try it with lemon. Do you ever make UK bread pudding? Well, I’ve come across many different sorts of bread puddings from different parts of the world but I didn’t know that there was one made with a special dehydrated bread. It sounds like an excellent dish. It’s fascinating isn’t it, variation of bread and its puddings in cuisines all round the world – hope you can try this one out, it is delicious. Must say love the bread and butter pudding a lot too! Sounds delicious, especially with the lemon. I have made a cookie that has its origins in Greece that seems similar. 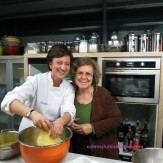 You start by making a cookie with a very high oil content (olive oil, preferably) and not much sugar. It makes a cookie that is quite crisp. Then you soak them in a sugar/honey/water syrup. Same idea, but I suspect your special bread ends up softer and more like pudding, while the cookies don’t expand so much and retain a firmer texture. I like the cookies so I know I’ll love this recipe, too. Thanks Catt, I wonder if that cookie is sekerpare -we share culinary history with Greece and a lot of dishes have similarities. Yes, this pudding is moister and I like the lighter & refreshing touch with lemon, glad you liked the post, hope you enjoy making it. I was wondering if you can put Turkish Kaymak recipe ,I would like to make it homemade.Thank you. Thank you for the Ekmek Kadaifi recipe. I will be making this for my dad, it is his favourite dessert from child hood. He is coming over for Sunday lunch to visit us and our new home and I really hope to impress him. Fingers X!